You really love to go camping. You love to go for days on end into the wild with your Jeep. Or you are having an all-day tailgating party at the stadium. Maybe you have a big family to feed for a week long tent camping trip, and a cooler just isn't going to hack it with the ice melting all over your food. 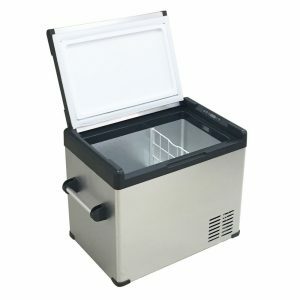 You need refrigerator reviews for the 12 volt DC portable freezer. If you’re looking for a DC portable freezer that can actually keep meat and other foods at refrigerator temperatures for days at a time, then you must go with a compressor style portable refrigerator. These 12-volt units serve as portable refrigerator freezers which mean you can set the temperature and it will keep food cool (or frozen) just as the fridge in your house does. Some of these 12 volt refrigerator freezers (or coolers) come only with a DC plug (cigarette lighter style). If you want to plug into A/C power, you will have to buy a separate AC cord.